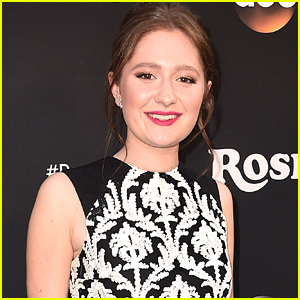 Emma Kenney Photos, News, and Videos | Just Jared Jr. It was a star-studded night at the Art of Elysium gala! Lili Reinhart, Lily Collins, and Lana Condor were all seen walking the red carpet at the Art of Elysium event on Saturday night (January 5) in Los Angeles. Bonnie Wright, Sofia Carson, Emma Kenney, and Riverdale actor Hart Denton were all also seen at the gala. 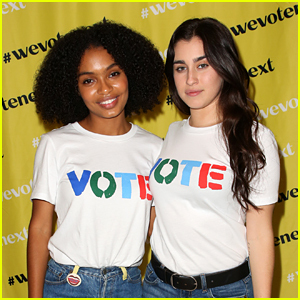 Yara Shahidi and Lauren Jauregui rock their ‘vote’ tees at the We Vote Next Summit event presented by Eighteen X 18 at TOMS Corporate Office on Saturday (September 29) in Los Angeles. The event brought out more stars including Emma Kenney, Chandler Kinney, Jenna Ortega, Karan Brar, Auli’i Cravalho and more. The summit convened young leaders from across the country to educate and inspire the most powerful voting block. “Eternally grateful for the my peer delegates, who traveled cross country, to spend the day in constructive conversation and community for our FIRST #wevotenextsummit,” Yara wrote on Instagram afterwards. If you don’t know Eighteenx18 was founded by Yara to educate and engage the next generation of voters. Vanessa Morgan poses with boyfriend Michael Kopech while attending the Entertainment Weekly Pre-Emmys party on Saturday (September 15) in Los Angeles. The Riverdale actress and her beau were joined at the event by Shay Mitchell, Candice Patton, Tommy Dorfman, and Francia Raisa. Also in attendance were Skyler Samuels, Emma Kenney, and Aubrey Anderson Emmons. “Last nights outfit made possible by double sided tape,” Shay captioned a photo on her Instagram the next morning. FYI: Shay is wearing Zuhair Murad. Skyler is wearing a Blumarine dress, Stuart Weitzman shoes, APM Monaco jewelry, and a Ming Ray bag. Vanessa is wearing a Speechless dress. 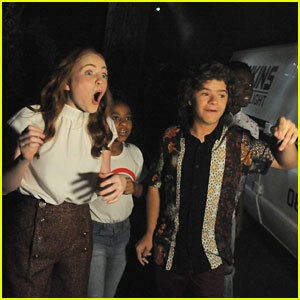 Sadie Sink, Priah Ferguson, Gaten Matarazzo, and Caleb McLaughlin go through the Stranger Things maze at Universal Studios Hollywood’s Halloween Horror Nights on Friday (September 14) in Universal City, Calif. The co-stars could be seen getting spooked in real life to things they encountered on their show. “Had a blast last night at @unistudios Hollywood Horror Night! Such an epic reveal of the @strangerthingstv maze. Shout out to all the fans & friends of the series. Last night was A-MAZ-INGLY scary. 😅💕Love you guys!” Priah shared on Instagram. Also in attendance at the opening night were Vanessa Hudgens, Bella Thorne with Mod Sun, Francia Raisa, Chloe Kim, Nolan Gould, Emma Kenney, Jaime Camil, Jamie Lee Curtis, Guillermo Diaz, Slash, and Travis Barker with his kids Alabama and Landon. Paris Berelc shows off her fit abs at Variety’s 2018 Power of Young Hollywood held at Sunset Tower Hotel on Tuesday night (August 28) in West Hollywood, Calif. The -year-old actress met up with her Alexa & Katie co-star Isabel May at the event, plus singers Daya and Madison Beer. Emma Kenney, who just announced her return to The Conners, was also at the annual party with Griffin Gluck. Stay tuned for more news about season two of Alexa & Katie! FYI: Paris is wearing a full H&M look and Alex Woo jewelry. Madison wore a in Misbhv dress, Jimmy Choo heels, Edie Parker clutch and Jennifer Fisher earrings. Daya is wearing an H&M shirt. Emma Kenney will be returning as Harris on The Conners, the new series replacing Roseanne, Deadline reports. Just before Roseanne Barr was fired from the show following her racist comments, the 18-year-old actress revealed she was quitting the show on social media with her fans. However, now with Roseanne being off the show and the new series returning to ABC, Emma will return as Harris, Darlene’s daughter. “I love being part of The Conner family and am so excited to share that Harris is back for #TheConners,” Emma shared the news on her Instagram. Ames McNamara and Jayden Rey will also be returning for the series, premiering this October on ABC.